Thank you ladies for your kind thoughts regarding my BSI and your faith in me in the kitchen! I hope I don't disappoint you but, BSI pumpkin attempt #1 was definitely a disaster. However, my goal for myself with these BSI entries is to try something new for me, which I did, and I feel like I learned something, which is good. So that is why I am still going to share the recipe + experience with you all (but Lindsay, please don't submit it! 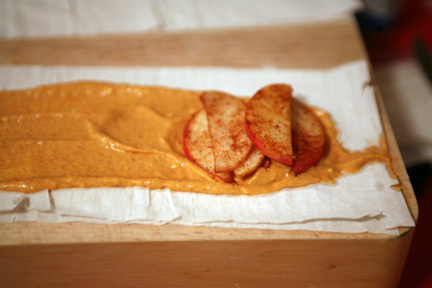 I have another recipe that I am going to post in the morning...). So, here goes. 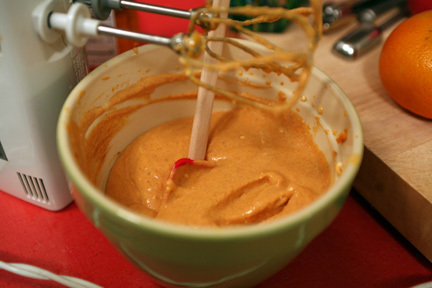 Combine all pumpkin cream ingredients together. 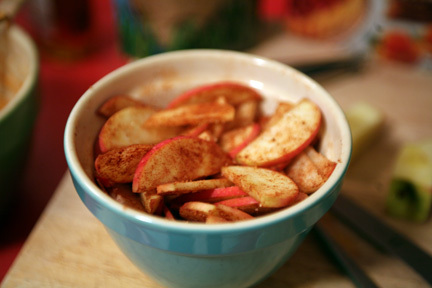 Combine apples with cinnamon and turbinado sugar in separate bowl. (this step has many modifications as evidenced by the photo above, but this is what seemed to work best...) Unroll phyllo dough. Take two sheets and lay them on cutting board. Cut in 1/2 down the length of the sheets. 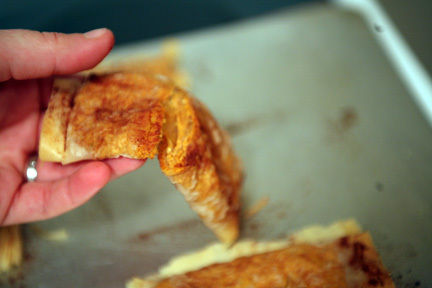 Spread pumpkin cream across one of the strips of dough. 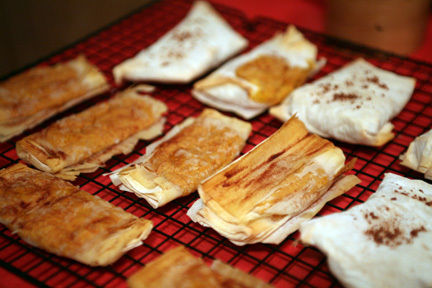 Pile a couple of spoonfuls of apple mixture at one end, and roll phyllo dough to form a little packet. Place packets on greased cookie sheet. Brush with egg white (I used butter, which was not good. I think an egg white would be better.) and sprinkle with cinnamon. Bake at 375* for 20 minutes, or until golden brown. Oh well. I'm over it now and have moved on to a new BSI recipe which I will post tomorrow. It satisfies another goal of mine, the "healthify classic favorites" challenge I set up for myself last weekend, so I'm pretty excited about it. On to the food diary. 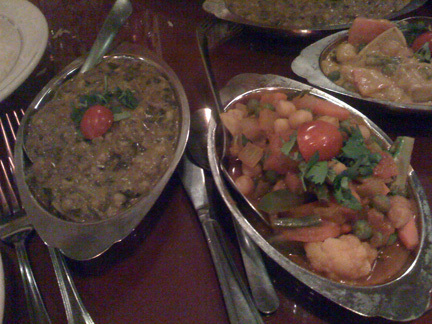 Dinner: Brian and I met a friend at our favorite Indian cuisine restaurant in town, Maharaja (sorry, no website). I LOVE Indian food. This restaurant gets me so excited because I know I am always going to have a great meal there with plenty of leftovers for the next day. Our meal tonight definitely brought the food dance out of me (reserved only for stellar eating experiences.) 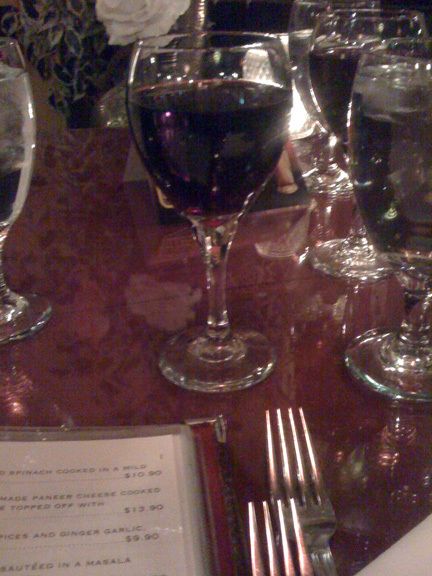 Sadly, the pictures are pretty awful (iphone + dark restaurant = grainy photos). I'll have better ones tomorrow when I eat my leftovers for lunch. 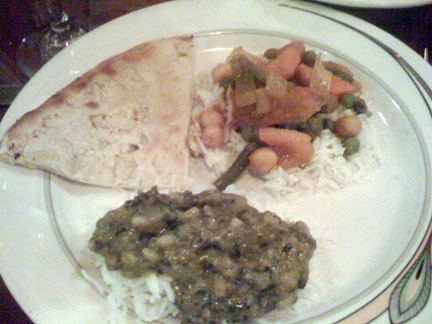 I had the Dal Saag (lentils and spinach in a cream-based sauce) and Vegetable Masala (veggies and chickpeas in a spicy tomato sauce) along with 2 pieces of naan (nobody can resist the naan!) and some white rice. I had double what you see on my plate below, about 1/2 the total entree you see in the picture above. 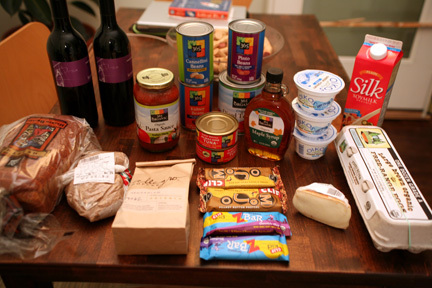 We went to Whole Foods afterwards, nice and full so we didn't buy the whole store. We did manage to spend a stupid amount of money per usual... It really got me thinking about all of you bloggies that are participating in the Thanksgiving Challenge. I am SO IMPRESSED with all of you and can't wait to see your final numbers. When we got home I looked through our freezer and pantry and realized that we have A LOT of food. I am hoping to next month adopt a similar challenge for Brian and I, even if just to cut our grocery bill in 1/2 for the month. It seems like great timing to clean out the fridge, freezer and pantry before going home to Florida for Christmas, and the perfect time of year to be saving money and giving thanks for what we have. 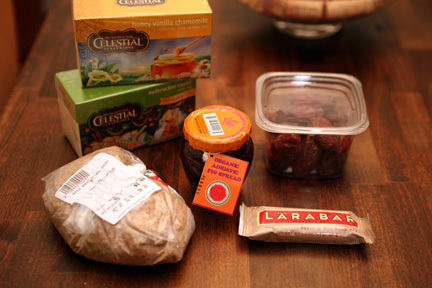 Here's our loot for the trip. We decided to do a separate Thanksgiving trip on Tuesday (hello crowds!!!) 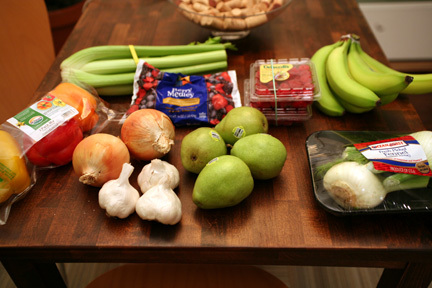 to get the veggies and other miscellaneous items we need for the big dinner. I'm sipping on the honey vanilla chamomile right now and it is yummy! It also means that I'm about ready for bed...chamomile is the perfect evening relaxer for me. I will post my official BSI entry in the morning, along with some preliminary Thanksgiving plans! I can't wait to hear what you all are doing for Thanksgiving!